Put the coriander seeds in a skillet and dry-roast over medium-high heat. Slide the skillet back and forth over the burner to prevent burning. When the spice exudes a pleasant aroma, about 1 minute, remove from heat and transfer to a bowl to cool. 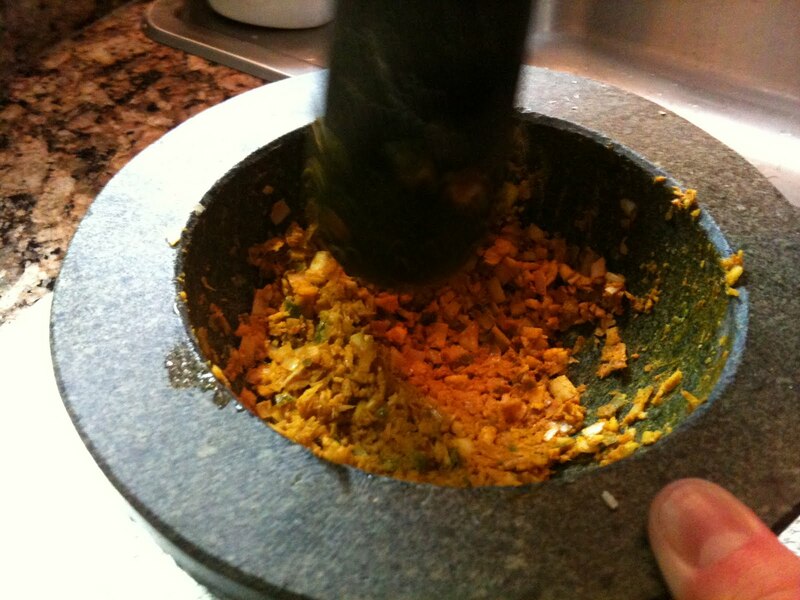 Grind in a mortar with a pestle and set aside. Pound the salt and chiles in a mortar with a pestle into a paste. Add the lemongrass, coriander seeds, turmeric powder, shallots, almonds, and red miso in sequence, and only after the previous ingredient is pureed and incorporated into a paste. Transfer to a mixing bowl and add the coconut cream. Mix well and set aside. Store the marinade in a glass jar with a tight fitting lid. Refrigerate, it will keep overnight. 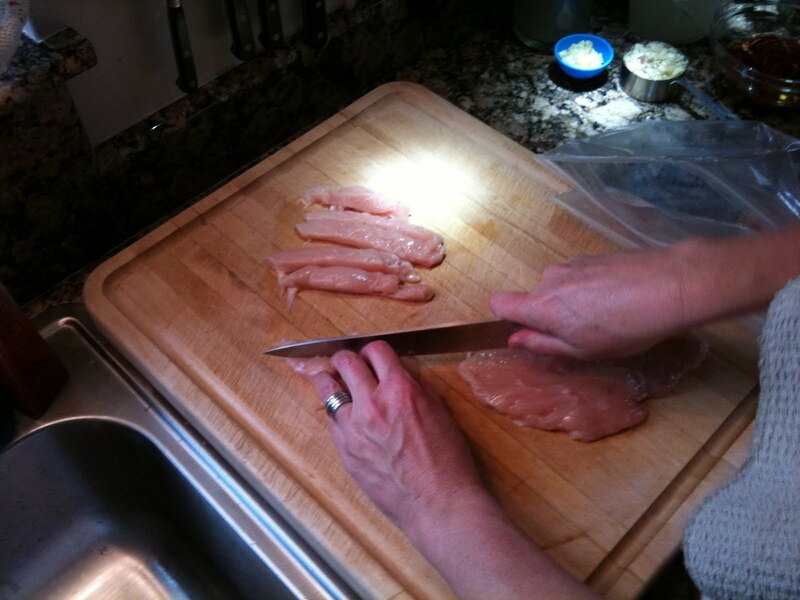 Slice the chicken, if using, diagonally across the grain into thing strips, approximately 1/10 inch wide, or as thin as possible. 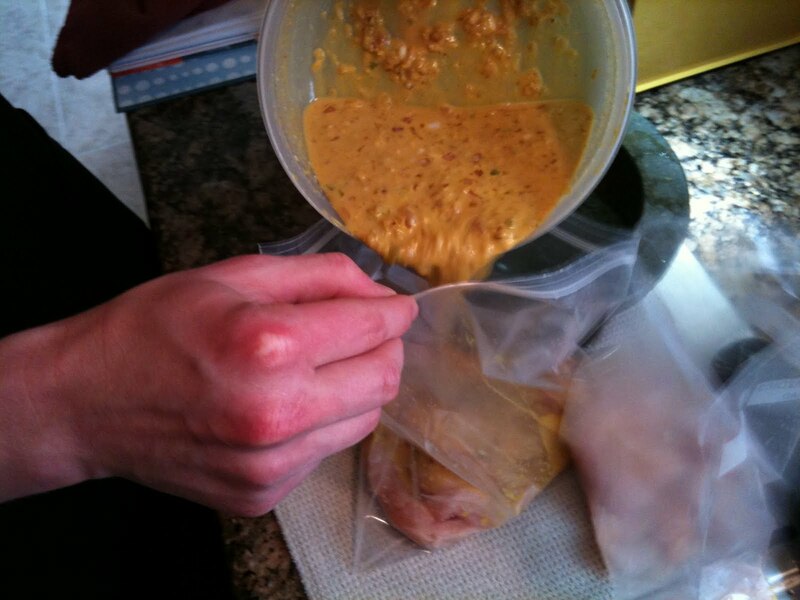 Add the meat to marinade in a zip lock bag. Mix well and let sit for 30 minutes. Mound the charcoals onto one side inside the grill, leaving the other half empty. Heat the grill. While waiting for it to get hot, thread 3 to 4 pieces of the chicken or pork onto the bamboo skewer into a tight bundle, covering 5 inches of the skewer. Repeat with the remaining skewers. Add the pineapple juice to the leftover marinade and set aside. Spray the skewers generously with the vegetable oil. Lay the skewer with the meat portion on the rack directly over the hot coals at medium-high heat. Line the skewers tightly close to one another. 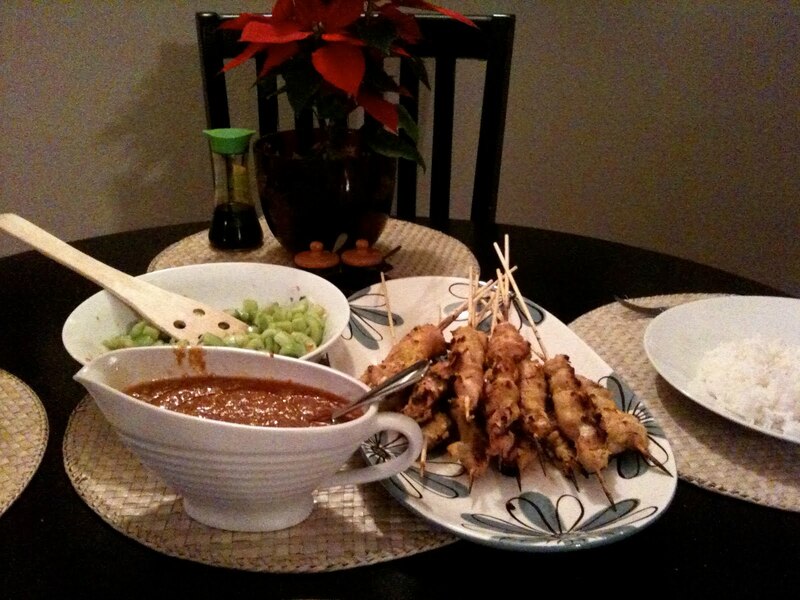 (The uncovered portion of the skewers should not be over the coals.) Brush lightly and frequently with the pineapple juice mixture. Turn frequently to prevent burning. Grill until the outside is crispy brown and the inside white and tender, about 10 to 12 minutes. Transfer to a serving platter and serve immediately with Peanut Sauce, Cucumber Salad ( recipe coming soon ) and Jasmine Rice. >Jenny's right, having these ingredients and working them into this wonderful dish in your kitchen is like a" time out" in your work a day world.